The steps taken to calibrate the photometry are as follows. 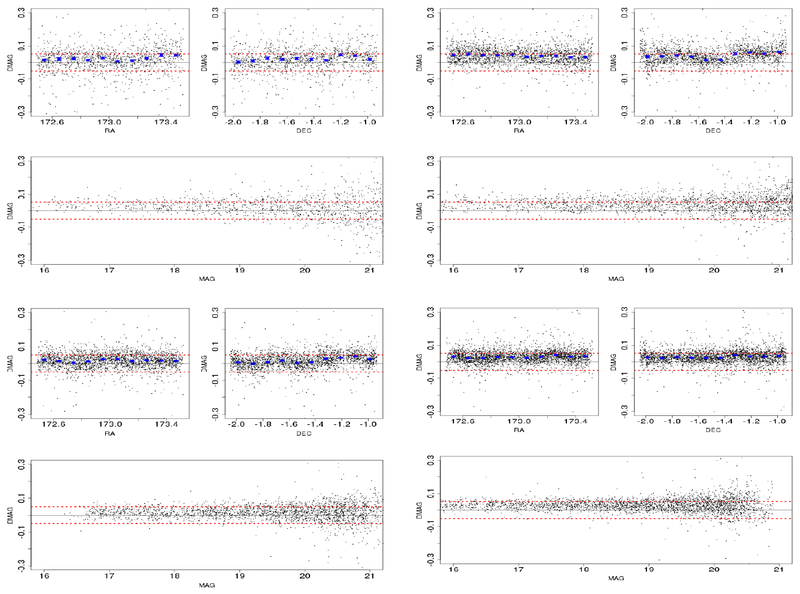 KiDS-ESO-DR1 photometric calibration starts with individual zero points per CCD based on SA field observations. The calibration deploys a fixed aperture (6.3 arcsec diameter) not corrected for flux losses, and uses SDSS DR8 PSF magnitudes of stars in the SA fields as reference. Magnitudes are expressed in AB in the instrumental photometric system (i.e., no color corrections between OmegaCAM and SDSS photometric system applied). From the overlapping sources across dithered exposures, zero point differences between the dithers (e.g. due to varying atmospheric extinction) are derived. Zero point differences across CCDs are calculated using all CCD overlaps between the dithered exposures. Steps 1 and 2 both apply a minimization algorithm (see Maddox et al. 1990, MNRAS, 246, 433). The zero point offsets are applied to all CCDs w.r.t. an average zero point valid for the night, derived from the nightly SA field observations. If no SA field observations are available for the night, default values are used instead. The photometric calibration provided in KiDS-ESO-DR1 is in AB magnitudes in the instrumental system. Color-terms have been calculated with respect to the SDSS photometric system. iKiDS - iSDSS = (+0.015 ± 0.006)(rSDSS - iSDSS). Derivation of color-terms of KiDS photometry w.r.t. the SDSS photometric system. Left: from top to bottom: gKiDS – gSDSS vs gSDSS – rSDSS; rKiDS – rSDSS vs gSDSS – rSDSS; iKiDS – iSDSS vs rSDSS – iSDSS. The distribution of stars (black dots) is overlayed with contours (green) and fit by a linear relation (red line, with blue lines indicating the statistical uncertainty). Right: similar analysis for uKiDS – uSDSS vs uSDSS – gSDSS. Clicking on the images will open a larger version. Unfortunately, the distribution of tiles included in KiDS-ESO-DR1 is not contiguous, with many isolated tiles. Because of this, a complete homogenization of the photometric calibration for the entire data set was not possible. This should improve greatly in future releases. 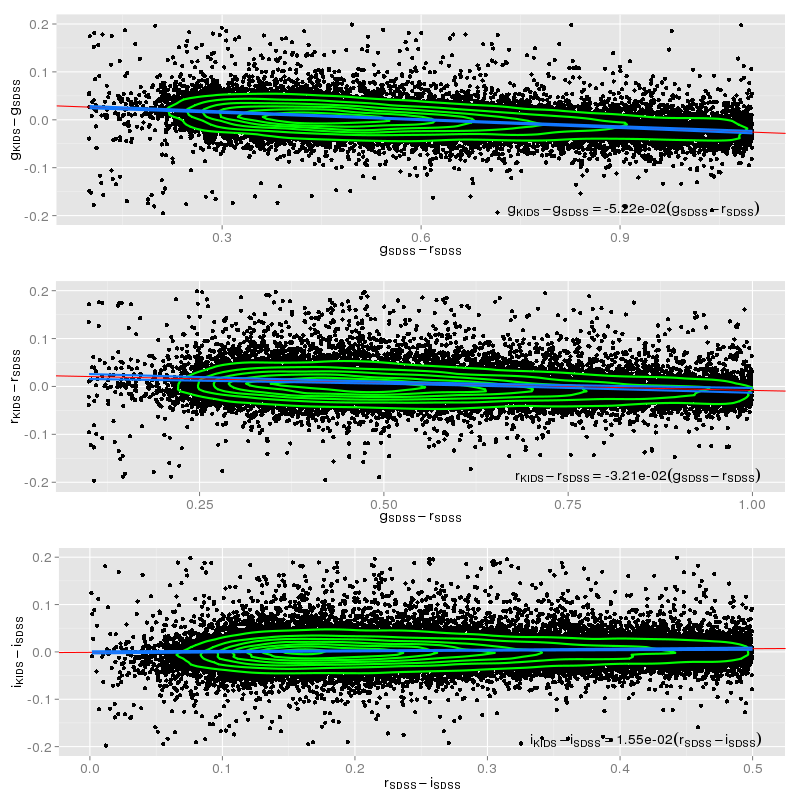 Both the internal photometric homogeneity within a coadd and the quality of the absolute photometric scale is assessed by comparing the KiDS-ESO-DR1 photometry to SDSS DR8 (Aihara et al., 2011, ApJS, 193, 29). This comparison can be done for all 41 tiles in the KiDS-North field. KiDS-South was calibrated in the same way as KiDS-North, so we expect the conclusions to hold for these data as well. PSF magnitudes were extracted from SDSS DR8 and compared to KiDS total magnitudes based on aperture magnitudes within an aperture of 2 times the FWHM applying a spatially dependent aperture correction derived from 10 arcsec aperture photometry of bright, non-saturated stars. The figure below shows the offsets between KiDS-ESO-DR1 and SDSS DR8 magnitudes for 1 tile (KIDS_173.0_-1.5), which is a representative example. Generally the photometry in one filter is uniform to within a few percent. Average peak-to-valley variations within a coadd are listed per filter in the table on the right. KiDS − SDSS DR8 magnitude offsets for stars in tile KiDS_173.0_-1.5 for u (top left), g (top right), r (bottom left) and i (bottom right). 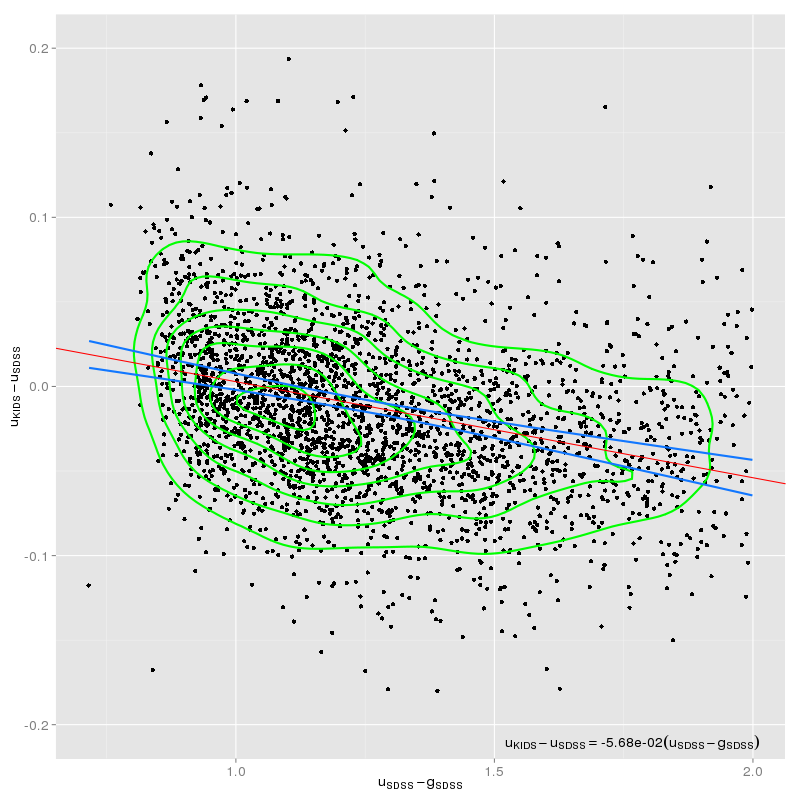 For each filter residual magnitudes are plotted as a function of RA, DEC (top row) and magnitude (bottom panel). Each dot corresponds to a star, while running medians are shown as blue bars. The red dotted lines indicate +0.05 and −0.05 magnitudes. Click on the image for a larger version. The quality of the absolute photometric scale is illustrated in the data quality section, where the photometry is compared between KiDS and SDSS for the 41 tiles in the overlapping area. A systematic offset of ~0.02 mag is present in g, r, and i. This could be due to the fact that nightly zero points are determined using a fixed aperture on stars in the SA field without aperture correction. The scatter is probably due to non-photometric conditions (during either KiDS or SA field observations) and use of default zero points for nights without good SA observations. Corrections for both become possible in future releases with significant contiguous area, which will allow a global calibration for the entire survey.